Actress Lizzy Anjorin has put to bed rumors that she has become the new wife of the Alaafin of Oyo. You will recall that Lizzy Anjorin recently became the Borokini Adini of Nigeria, a Religious chieftaincy title bestowed on her by the Alaafin. 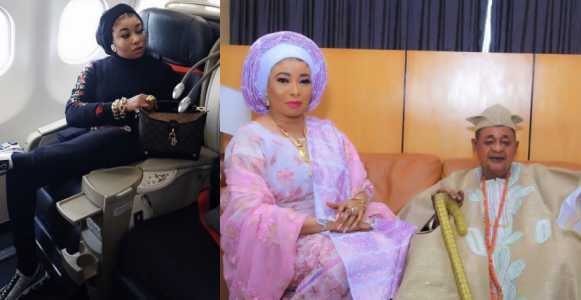 A picture also surfaced showing her seating beside the Alaafin who was seated on his throne. This made many draw conclusions that she might have tied the knot with the king who already had 4 wives. 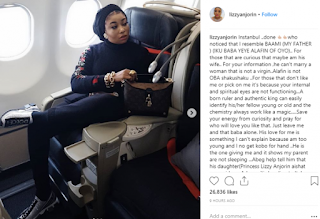 Reacting to the rumors, Liz Anjorin stated that she is not married to him and can’t because the Alaafin only marries virgins. For those that don’t like me or pick on me it’s because your internal and spiritual eyes are not functioning…A born ruler and authentic king can easily identify his/her fellow young or old and the chemistry always work like a magic…..Save your energy from curiosity and pray for who will love you like that. Just leave me and that baba alone. 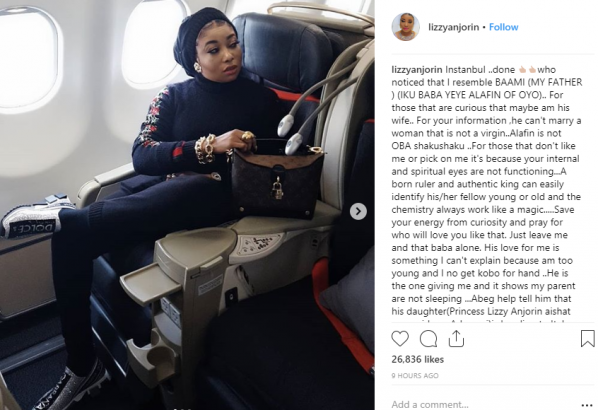 His love for me is something I can’t explain because am too young and I no get kobo for hand ..He is the one giving me and it shows my parent are not sleeping …Abeg help tell him that his daughter(Princess Lizzy Anjorin aishat eganmidogo Adeyemi)is heading to Italy’.